After a brief pause in eruptions that occurred in late March 2010, the Eyjafjallajökull Volcano in Iceland began erupting again on April 14, 2010. The resulting ash plume rose to high altitudes and was subsequently carried across the North Atlantic, causing closure of the airspace over northern Europe, grounding thousands of flights and stranding travelers around the world. The particles contained in volcanic ash clouds can cause significant damage to jet engines and the outside of aircraft. This image is a perspective view acquired April 14, 2010 by the 70-degree forward-viewing camera from the Multi-angle Imaging SpectroRadiometer (MISR) instrument aboard NASA's Terra spacecraft, looking southward at the plume. East is at the left. The image is approximately 76 kilometers (47 miles) wide, and is centered approximately 60 kilometers (37 miles) east of the volcano. Stereoscopic analysis of the data from this and another of MISR's cameras put the height of the plume at about 7.3 kilometers (4.5 miles), more than three times higher than the low clouds that are visible in much of the scene. 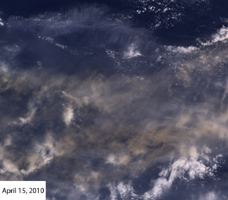 Ash from the recent eruptions was viewed again on April 15, 2010, to the north of the British Isles. Figure 1 is a view from MISR's nadir (vertical-viewing) camera, and shows the ash as a brownish-colored plume. This image measures 212 by 185 kilometers (132 by 115 miles) and its center is located between the Faeroe and Shetland Islands. Here, north is at the top and east is at the right. Figure 2 shows stereoscopic heights superimposed on the image, along with a color-coded scale. There are three main components of this scene: low clouds at altitudes below 2.5 kilometers (1.6 miles), the ash plume between 3 and 4.5 kilometers (1.9 and 2.8 miles), and cirrus clouds near 8 kilometers (5 miles). Interestingly, the retrieved heights of the ash plume in this image are lower than the range of 5.4 to 10 kilometers (3.4 to 6.2 miles) reported in the media. MISR was built and is managed by NASA's Jet Propulsion Laboratory, Pasadena, Calif., for NASA's Office of Earth Science, Washington, DC. The Terra satellite is managed by NASA's Goddard Space Flight Center, Greenbelt, Md. 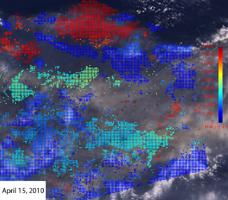 The MISR data were obtained from the NASA Langley Research Center Atmospheric Science Data Center. JPL is a division of the California Institute of Technology.